Cork taint is going to the dogs—literally. Chile-based cooperage TN Coopers has enlisted the help of our furry best friends to track down TCA, TBA (2,4,6-tribromoanisole) and other harmful compounds that make wine unpleasant or even undrinkable, and plans to bring its highly trained team of wet noses and wagging tails to the greater wine world. Dubbed “the Natinga Project,” the program was inspired by airport canine security units. “The underlying principle is that dogs have a much wider olfactory threshold than humans, and thus can detect very small concentrations of specific compounds just by their sense of smell,” Guillermo Calderón, the cooperage‘s marketing manager, told Unfiltered. 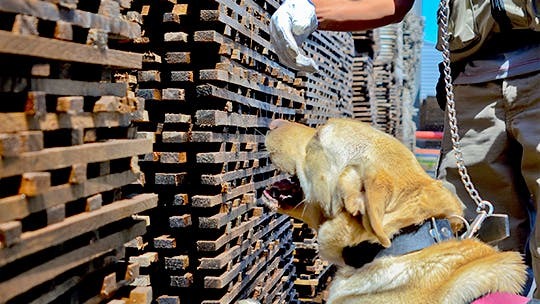 Except instead of drugs and internationally-smuggled sausages, the Natinga dogs have been trained to search for compounds that create those unmistakable aromas of wet cardboard, damp newspaper or moldy basement that ruin the flavor of wine (for humans, anyway). Moro’s favorite treat is the knowledge that his work saved wine lovers from purchasing tainted bottles! While corks get all the condemnation, there are other steps in the winemaking process that are vulnerable to contamination, including barreling. Cooperages have some tech to detect the presence of airborne chemicals, but it’s not so easy to find the source of them. That’s where the pups come in: “Natinga” translates to “search of origin” in the Zulu language. The project now employs five pollutant-detection experts, otherwise known as Labrador retrievers. Ambrosia, Odysé, Moro, Mamba and Zamba patrol the TN Coopers property near the town of Curacaví in Chile and also provide their services for wineries, with plenty of success stories to boast about, if they could talk. Mingling with friends and neighbors while jamming out to live music and sipping wine: A party scene at the local watering hole—or church? A new wine lounge coming to Pittsburgh is a bit of both. The soon-to-be Mary’s Vine began life in 1903 as the Visitation of the Blessed Virgin Mary Church in Rankin, Pa.; the last Mass was held in 2011. But the cavernous vaulted nave and neo-Gothic pointed-arch windows reappeared—on Craigslist, seven years later—and caught the eye of a young Sacramento transplant named Jordan Stasinowsky. 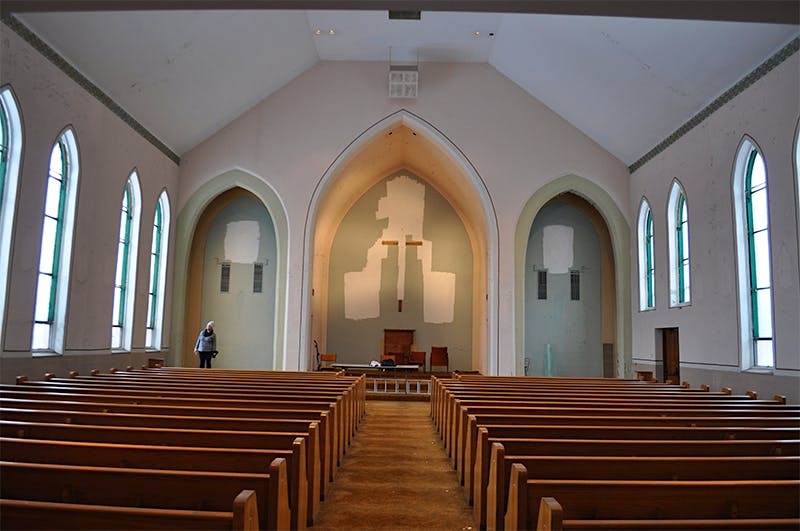 “The pictures painted a pretty horrid picture of the interior, as the building had been neglected for many years,” Stasinowsky told Unfiltered via email. 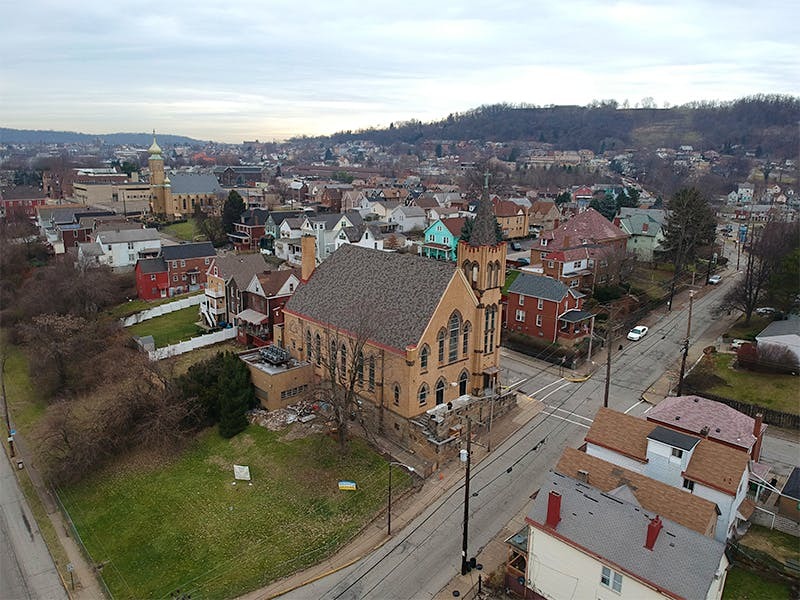 It wouldn’t do for a fixer-upper home, but Stasinowsky pitched another idea to his family: They could join him in Pittsburgh, renovate the place and open it up to the community again, as a restaurant and wine lounge. 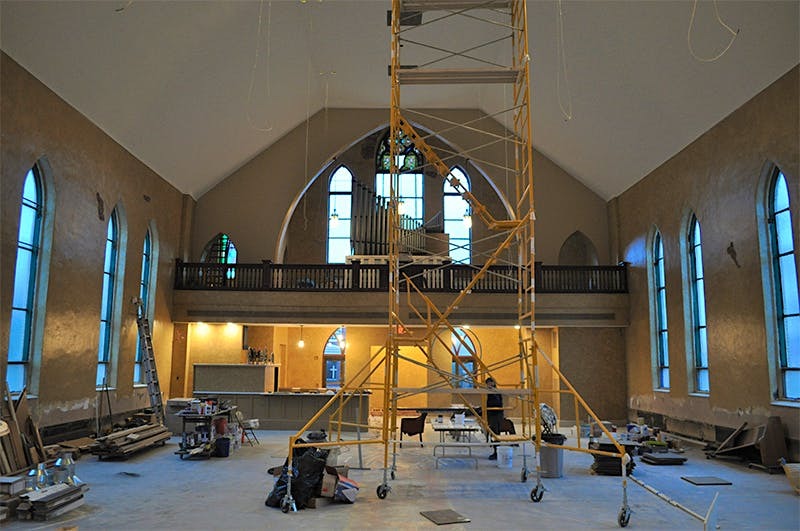 One year later, the roofing, electrical wiring, plumbing, HVAC and paint have been replaced or redone, and the centerpiece, a two-story, 4,800-bottle, glass-enclosed wine cellar is rising in the chancel area behind where the altar stood. 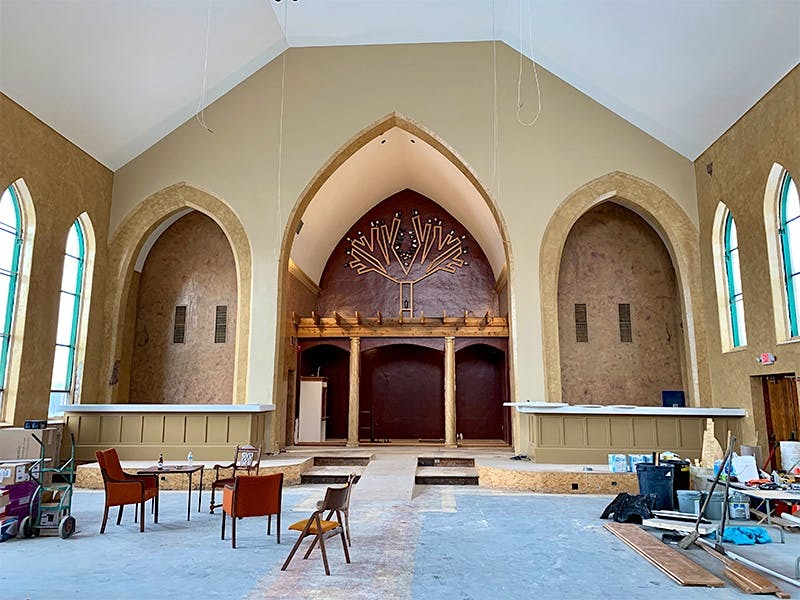 When Mary’s Vine opens in April, there will be a list of 300 wines, a kitchen, and live jazz mixed in with some throwback tunes for those looking for that old-time religion. “Yes, the [original] organ will be functional,” confirmed Stasinowsky. The Bachelor franchises, viewers may be aware, involve a lot of wine schemes. Drinking wine. Throwing wine. Romancing around wine. Romancing a winemaker? And of course, a winemaker, romancing. 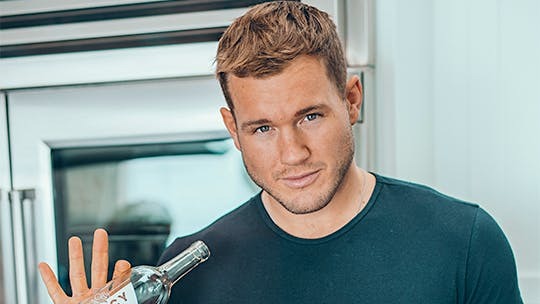 Every day’s a rosé ceremony for Colton Underwood. Current Bachelor and former NFL player Colton Underwood knows the game—this is the show’s 23rd season (! ), after all. For his charity, the Colton Underwood Legacy Foundation, Underwood teamed up with Denver-based Carboy Winery to launch a new rosé, 65 Roses, to raise money for people living with cystic fibrosis. “The story surrounding the [wine’s name] dates back decades to a young child with cystic fibrosis who, when hearing the name of his disease for the first time, pronounced ‘cystic fibrosis’ as ‘sixty-five roses,'” Underwood told Unfiltered via email. “It’s just the right mix of sweet and crisp, yet silky,” he said of the wine, which is 91 percent Pinot Gris and 9 percent Moscato. Though the rose man drinks pink, Unfiltered learned that he’s a white-wine guy when it comes to dealing with highly distressing on-camera situations. A recent episode saw Underwood engaging in the time-honored “being sad alone with wine” Bachelor trope, and as he tweeted, “A glass of white wine never hurt anyone … or three.” While Underwood told Unfiltered that the foundation hasn’t yet determined if they’ll be adding more wines to accompany 65 Roses, we predict the next would probably be a nice Chardonnay or Pinot Grigio. Prince Robert of Luxembourg, owner of Bordeaux first-growth Château Haut-Brion and Wine Spectator Restaurant Award winner Le Clarence in Paris, is no stranger to a good time with food and wine. So Robert and his Franco-“American” wine operation teamed up with the fashion world’s equally global citizenry to throw a grand “Dîner de la Mode de Sidaction” for a cause—raising money in the fight against HIV/AIDS. Pamela Anderson and designer Jean-Paul Gaultier said a few words for the occasion. Celebrities like Juliette Binoche, Line Renaud, Jean-Paul Gaultier, Monica Bellucci and Pamela Anderson were in attendance at the 17th edition of the fête at the Pavillon d’Armenonville in Paris. They noshed on Le Clarence chef Christophe Pelé‘s preparations of line-caught sea bass with beetroot gnocchi, foie gras, haddock and citron-caviar. To pair with Pelé’s menu, gala-goers drank the 2015 vintage of Domaine Clarence Dillon’s Clarendelle range, donated by the Haut-Brion parent company. For those seeking bigger bottles and grander vins, an auction featured wines donated by Prince Robert: a magnum of Haut-Brion 2001, a magnum of Château La Mission Haut-Brion 2005 and an imperial of Château Quintus 2015. All in, the night, organized in partnership with the Fédération de la Haute Couture et de la Mode, brought in some $733,000. Mounir Saouma has earned a reputation as a talented vigneron over the past two decades, establishing Burgundy’s Lucien Le Moine and Châteauneuf’s Rotem & Mounir Saouma as benchmark houses in regions where that can take hundreds of years. But he’s also an ardent advocate for cancer research, and this week, he’s united his passions in an epic charity auction to benefit the Institut Curie in Paris—the lab founded by Marie Curie herself. On the block: a morning ramble through grands crus from Clos de Bèze to Montrachet, with 16 stops to taste along the way and wines from Echézeaux, Clos de Vougeot and Musigny in the mix. Bottles up for grabs—all procured by Saouma directly from the wineries—include a Salmanazar (that’s 9 liters) of Lucien Le Moine Romanée-St. Vivant 2007, imperials (6 liters) of 2015 Ornellaia and J.F. Mugnier Nuits-St.-Georges 1er Cru Clos Maréchal Rouge 2008, and Jeroboams of gems like ’96 Pétrus, 2007 Cristal and the rare white Margaux Pavillon Blanc 2012. “Remember why we do this,” Saouma told Unfiltered via email. “Fighting with wine against cancer.” The bidding has surpassed more than $90,000 so far, but interested players can still submit bids before 4 p.m. Burgundy time on Friday, Feb. 15. Get more details here or by emailing llm@lucienlemoine.com.